E-Verify is an Internet-based system operated by U.S. Citizenship and Immigration Services (USCIS) in partnership with the Social Security Administration (SSA). E-Verify is currently free to employers and is available in all 50 states. It provides an automated link to federal databases to help employers determine employment eligibility of new hires and the validity of their Social Security numbers. While its usage remains voluntary throughout the country, some states have passed legislation making its use mandatory for certain businesses. HB 56 (Beason-Hammon Alabama Taxpayer and Citizen Protection Act) - Passed in 2011, HB 56 is regarded as many as the nation's toughest immigration enforcement law passed at the state level. HB 56 requires all businesses, public and private, to begin using E-Verify by April 2012. The penalty for businesses not complying with the E-Verify mandate is a suspension of its business license. HB 2779 (Arizona Fair and Legal Employment Act) - Passed in 2007, HB 2779 prohibits employers from knowingly hiring undocumented workers and requires all employers to use E-Verify, effective January 1, 2008. It was followed up in 2008 with HB 2745, which prohibits government contracts to any businesses not using E-Verify, effective May 1, 2008. AB 1236 - In October, 2011, Gov. Jerry Brown signed AB1236 into law. The law prohibits state municipalities from passing mandatoy E-Verify ordinances. HB 1343 - Passed in 2006, HB 1343 prohibits state agencies from entering into contract agreements with contractors who knowingly employ illegal aliens and requires prospective contractors use E-Verify to ensure legal work status of all employees. 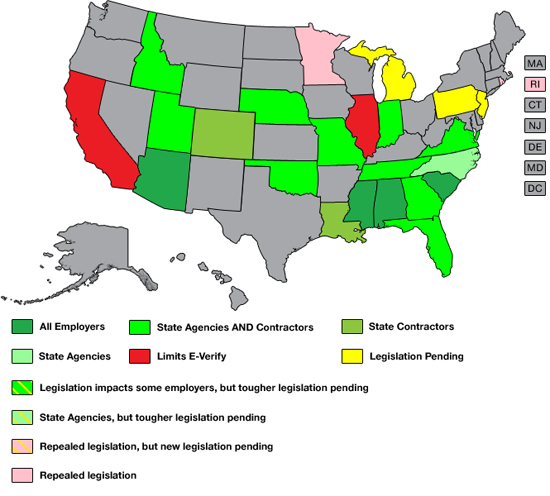 In 2008, SB 193 was passed requiring contractors with state contracts to use E-Verify. The effective date for SB 193 is August 6, 2008. SB 529 - Passed in 2006, SB 529 requires public employers, contractors and subcontractors with 500 or more employees to participate in E-Verify for all new employees, effective July 1, 2007. Public employers, contractors and subcontractors with more than 100 employees (but less than 500) must use E-Verify on or before July 1, 2008 and public employers, contractors and subcontractors with fewer than 100 employees must use E-Verify on or before July 1, 2009. HB 87 - Passed in 2011, HB 87 requires all private businesses with more than 10 employees to use E-Verify. The phase-in began on July 1, 2011 and runs through July 1, 2013. Executive Order - In May, 2009, Gov. Butch Otter signed an executive order requiring all state agencies and contractors to use E-Verify if they wanted a share of the state's $1.24 billion from the economic stimulus bill. In December 2006, Governor Jim Risch also issued an executive order, with immediate effect, requiring that state agencies participate in the E-Verify system. HB 1774 - HB 1744 bars Illinois companies from enrolling in any Employment Eligibility Verification System until accuracy and timeliness issues are resolved. Illinois also enacted HB 1743, which creates privacy and antidiscrimination protections for workers if employers participating in E-Verify don’t follow the program’s procedures. On August 24, 2009, Illinois enacted S1133 prohibiting the state or localities from requiring employers to use an employment eligibility verification system. SB 590 - Passed in 2011, SB 590 requires state and local agencies and state and local contractors to use E-Verify. The bill also require private employers to use E-Verify in order to qualify for certain tax credits on their state income taxes. HB 342/HB 646 - Passed in 2011, HB 342 requires all state and local contractors to use E-Verify. HB 646 requires private employers to either use E-Verify or check multiple forms of identification from the new hire, which must be kept on file. The bill states that employers that chose to use E-Verify to check the status of new hires have acted in "good faith" and are protected from prosecution. HB 4355 - Offered by Rep. David Ogema, HB 4355 would require that state and local government offices, and agencies that refer employees to those offices, verify new hires through E-Verify. Executive Order - In January 2008, Governor Tim Pawlenty issued an executive order effective, January 29, 2008, stating that all hiring authorities within the executive branch of state government as well as any employer seeking to enter into a state contract worth in excess of $50,000 must participate in the E-Verify program. The executive order expired 90 days after Pawlenty left office. Emmer Amendment - In February, 2009, Rep. Tom Emmer offered and the State House approved an amendment requiring the mandatory use of E-Verify for anyone receiving funds from a $1 billion stimulus bill. SB 2988 - Passed in 2008, SB 2988 requires public and private employers to participate in E-Verify with full participation by July 2011. HB 1549 - Passed in 2008, HB 1549 requires all public employers to use E-Verify. If a court finds that a business knowingly employed someone not authorized to work, the company’s business permit and licenses shall be suspended for 14 days. Upon the first violation, the state may terminate contracts and bar the company from doing business with the state for 3 years. Upon the second violation, the state may permanently debar the company from doing business with the state. L 403 - Passed in 2009, LB403 requires state and local governments and contractors to use E-Verify effective October 1, 2009. The bill also includes incentives for private employers to use E-Verify. SB 1523 - Passed in 2006, SB 1523 requires all state agencies, offices, and universities to use E-Verify. The law applied to all employees hired after January 1, 2007 except for local education agencies which was March 1, 2007. HB 36 - Passed in 2011, HB 36 requires all employers with more than 6 employees to use E-Verify. The phase-in period begins in October 2012 and runs through July 2013. Seasonal workers are not required to be verified through E-Verify. HB 1804 (Oklahoma Taxpayer and Citizen Protection Act) - Passed in 2007 and made effective on November 1, 2007, HB 1804 requires public employers, contractors and subcontractors to participate in E-Verify and requires income tax withholding for independent contractors who do not have valid Social Security numbers. HB 738 - Offered by Rep. Daryl Metcalfe, HB 738 requires all employers in Pennsylvania to use E-Verify. Executive Order - In March 2008, Governor Carcieri issued an executive order requiring executive agencies to use E-Verify; and for all persons and businesses, including grantees, contractors and their subcontractors and vendors to use E-Verify. Shortly after taking office in 2011, Gov. Lincoln Chafee rescinded Gov. Carcieri's executive order. HB 4400 - Passed in 2008, HB 4400 requires the mandatory use of E-Verify for all employers by July 1, 2010. All public employers, private employers with more than 100 employees and public contractors with more than 500 employees were required to comply by January 1, 2009. All private employers must comply by July 1, 2009 and all other all businesses by January 1, 2010. HB 1378 - Passed in 2011, HB 1378 requires all employers with at least 6 employees to use E-Verify. The phase-in begins in January 2012 and runs through January 2013. Companies that utilize legal guest workers do not have to use E-Verify. SB 0251 - Passed in 2010, SB 0251 requires all employers with more than 15 employees to begin using E-Verify July 1, 2011. Companies that utilize legal guest workers do not have to use E-Verify. SB 81 - Passed in 2008 and made effective on July 1, 2009, SB 81 requires public employers, public contractors and subcontractors to E-Verify and makes it illegal to discharge a lawful employee while retaining an unauthorized alien in the same job category. HB 737 - Passed in 2010, HB 737 requires all state agencies to begin using E-Verify by December 1, 2012. HB 1859/SB 1049 - Passed in March 2011, the bill requires all state contractors with at least 50 employees and a contract worth at least $50,000 to use E-Verify.